The Dōngzhì Festival or Winter Solstice Festival is one of the most important festivals celebrated by the Chinese and other East Asians during the Dongzhi solar term (winter solstice) on or around December 22 when sunshine is weakest and daylight shortest. It will occur on December 22 (East Asia time) in 2010. Is also a time for the family to get together, to make and eat tangyuan (湯圓) or balls of glutinuous rice, which symbolize reunion. 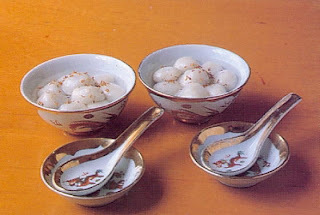 Tangyuan are made of glutinuous rice flour and somet in different type of coloured. Each family member receives at least one bowl of tangyuan.